A couple of weeks ago I was at the Lviv Publisher’s Forum, talking about the Ukrainian translation of my novel Dream Land. This annual forum in the West Ukrainian city of Lviv fills libraries, universities, coffee houses and theatres with a bewildering array of readings, discussions, concerts and lectures. Highlights for me were an all-night poetry slam, a Crimean Tatar-Ukrainian jazz fusion performance, meeting Lviv publishers Stary Lev, and a session with authors Oksana Zabuzhko from Ukraine and Katerina Tuckova from the Czech Republic held in a fabulous, faded Baroque theatre than could have been a Hammer horror film set. In-between, there was time to wander the cobbled streets with their glorious central-European architecture. Over the last hundred years Lviv has changed its name four times as it has belonged to the Austro-Hungarian Empire, Poland, the Soviet Union and Ukraine. It’s seen its fair share of 20th century horrors, and has a largely undeserved reputation for extreme nationalism. In fact, it feels like a city that is confident and at ease with its identity: consciously cultured; literary; tolerant; polyglot; central-European. This is a sign I noticed on a Lviv trolleybus window. 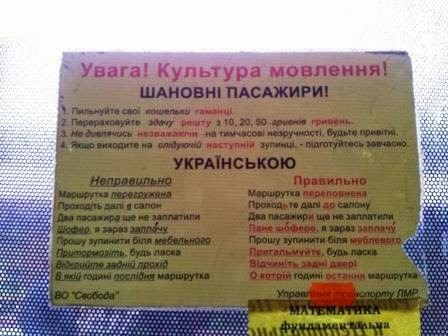 Printed by the nationalist political party Svoboda, it is instructions in public transport etiquette: how to buy a ticket, ask the driver to stop and so on in polite, correct Ukrainian. “This may be a case when the term ‘grammar Nazi’ isn’t exactly an exaggeration,” a non-Ukrainian friend commented when he saw it. It made me think about the line between being proud of one’s language and heritage, and wanting to impose it on those from other heritages. Much of the publisher’s forum was about cultural exchange and translation, a celebration of how literature can bridge national divides. But this year, for the first time in 23 years, Russian publishers were not invited to attend. The decision roused much furious debate and anxious soul-searching in literary circles. Russian and Russian-language books, publishers and bookshops have dominated the Ukrainian literary market for 23 years. A recent spate of openly anti-Ukrainian literature from mainstream Russian publishers undoubtedly influenced the forum decision. But when does pride and protectionism become chauvinism and censorship? Does wanting to protect one’s own language, and encouraging people to speak it correctly and beautifully, make someone a ‘Nazi’? Re language nationalism, once a language is gone, it's hard to bring it back. Look at all the languages of various tribes and small nations that are down to a handful of speakers! Hebrew came back,with the efforts of one man, Ben Yehudah, but it had never qute gone away, it had just been relegated to prayers. It needed modernisation, but there was material to work with. Other languages are not that fortunate. Re general grammar nazism, as a slush reader I will simply throw back any submissions where the author hasn't bothered to get it right. I don't mean the occasional split infinitive, but truly horrible grammar. Such stories are always awful anyway. I don't see why I should wade painfully through a story whose author took no trouble over, or pride in, their work. That said, I'm a 'grammar nazi' - I hate it when people use English lazily and want to get rid of the things that make it (for me) complex and beautiful - semicolons, all the tenses... I feel more strongly about it having spent time with people whose native languages are either dying or already dead through repression and assimilation. Hebrew is a really interesting example of language revival. I don't know much about it - was there an accepted 'correct' form or did Yehudah construct one? He did have a lot of work to do when writing his dictionary. The language really needed new words. Imagine English was no longer spoken and all you had to work with was the orks of Shakespeare! But it's not so different that someone who can speak and read modern Hebew would have any trouble with reading the Bible. I think a lot of what we think of as Biblical language is that way because it was translated into ENGLISH hundreds of years ago. Sometimes Ben Yehudah would put together two old words to make a new one, but nobody uses them any more; it's easier, sometimes, to use the English word. I suppose his words are the "correct" ones, but in a living language you can't impose them, can you? And even he made them up, so are they any more correct? My favourite story about Ben Yehuda is that he made his children speak Modern Hebrew, and only Modern Hebrew, when no one else did. In the case of Ukrainian, I don't think it is surprising in the current situation that there are efforts to preserve and promote the Ukrainian language. I would like to speak up against using the word 'Nazi' out of context about something like grammar. We can come up with a better word, surely? Keren, I agree about the word 'nazi'. like 'fascist', it is used far too carelessly. How interesting, Sue, that Ben Yehuda made up words but people use the English imports instead. are imported words adapted to conform to Hebrew grammar or pronunciation? There was a recent law put forward in Russia to ban use of 'foreign' import words in Russian. A lot of people pointed out that this would ban about half the language. In fact the party which proposed it, the extreme nationalist LDPR, takes its initials from 'Liberalno-Demokraticheskaya Partiya Rossii' or liberal democrat party of Russia - which makes three out of four words of its name foreign imports.